Alan Taylor recently investigated where Google Maps’ Street View coverage ends — “whether blocked by geographic features, international borders, or simply the lack of any further road” — and compiled a photographic look at the ends of the road. MyReadingMapped makes use of Google Maps & Google Earth to tell stories about history. For instance, here are maps of The Civil War and the American Revolution, a map of Roald Amundsen’s 1910 South Pole expedition, and a map of the wars of Alexander the Great. Working with the USGS, NASA, and Time, Google has built a viewer for satellite image time lapses. Among the images are those of the deforestation of the Amazon rainforest, the retreat of an Alaskan glacier, and the growth of Dubai. You can also refocus the map on any other area you want. More info here and here’s the extensive Time feature. View the maps from the David Rumsey Historical Map Collection overlaid on their locations on Google Maps. Your Apple Maps nightmare is over. Google has (finally!) released an iOS app for Google Maps. A really nice analysis of the readability of maps from the three big online mapping companies: Google, Bing, and Yahoo. As you might expect, Google is the clear winner; they pay more attention to the little details than the other two services. It turns out that Google uses a variety of techniques and visual tricks to help make its city labels much more readable than those of its competitors. From the use of different shadings to decluttering areas outside of major metro areas, it sure seems like Google has put a lot of thought into how it displays the labels appearing on its maps. I have no doubt that little touches like these are among the many reasons why Google remains the web’s most popular mapping site. An assessment: what sort of photographer is the Google Street View car? Initially, I was attracted to the noisy amateur aesthetic of the raw images. Street Views evoked an urgency I felt was present in earlier street photography. With its supposedly neutral gaze, the Street View photography had a spontaneous quality unspoiled by the sensitivities or agendas of a human photographer. It was tempting to see the images as a neutral and privileged representation of reality — as though the Street Views, wrenched from any social context other than geospatial contiguity, were able to perform true docu-photography, capturing fragments of reality stripped of all cultural intentions. David Friedman used Google Maps Street View to see what America’s other 1600 Pennsylvania Avenues look like. Perhaps when Bush leaves office, he can buy the fixer-upper at 1600 Pennsylvania Ave in Dallas, TX as a retirement home. Google has added transit directions to Google Maps. Finally. We’ve just added comprehensive transit info for the entire New York metro region, encompassing subway, commuter rail, bus and ferry services from the Metropolitan Transit Agency (MTA), the Port Authority of New York and New Jersey, New Jersey Transit and the City of New York. One feature I’d like: a quick at-a-glance comparison of the three travel methods (walking, subway/train, driving) to see which is going to take less time. 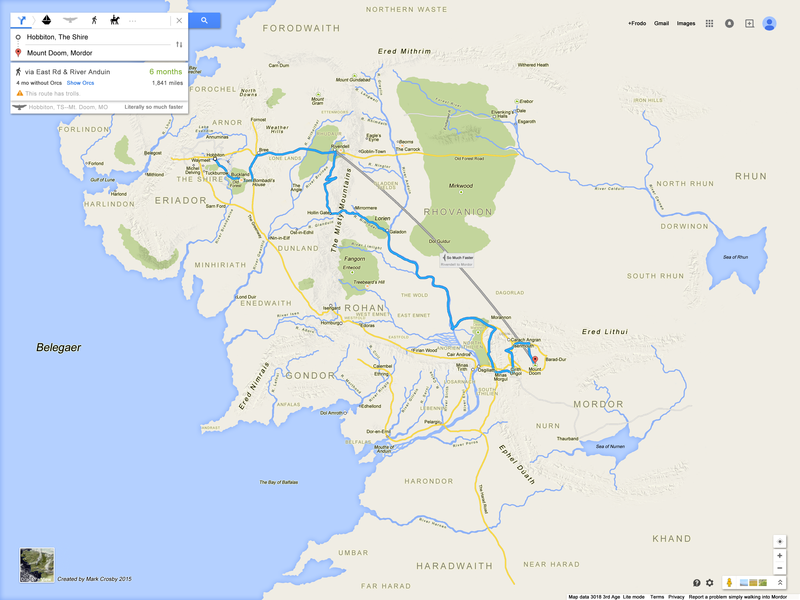 Alan Taylor has collected the longest drives that Google Maps will give driving directions for. It turns out there are multiple “longest drives”, because the Google Maps World is partitioned (many countries don’t support driving directions), and sometimes ferries are included, and sometimes they are not. The longest he’s found so far is from the Aleutian Islands to the tip of Newfoundland, a distance of over 7,200 miles. You can drag the path around to make it a lot longer (more than 11,000 miles) but that’s cheating.